Optimal milling paths & drilling operations for an efficient production. The 2D / 2.5D milling with NC features offers the user a wide variety of functions and convinces with its ease of use, optimum ease of use and a high degree of safety in programming. Thanks to the CAM system the creation of simple workpieces on the one hand, but also of complex components on the other hand, is up to 80% faster. The processing takes place on the 3D model whereby an automatic transfer of geometry data is possible. Intelligent machining strategies enable short toolpaths. vectorcam recognizes model features and model shapes such as groove, slot, drill hole, contour, curve etc. automatically. Frequently recurring edits can be saved immediately, invoked and edited as desired. The integrated collision check also ensures tools, materials and the machines. Thus, the module 2D / 2.5D Milling NC features is therefore worth an investment. 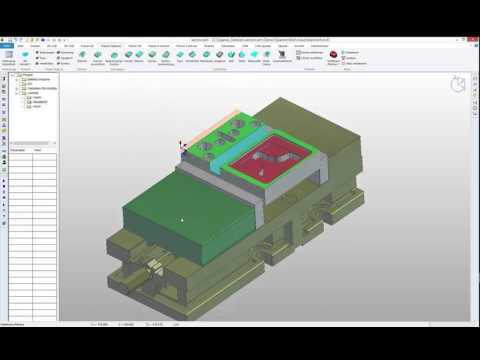 With the feature Face milling it is possible to calculate CNC paths for flat model surfaces or the stock material. The plan processing occurs in one or more deliveries. Further details are an safe distance, type of spillover connection, zigzag as well one-way etc. Furthermore, a permanent collision check avoids contact with, for example, clamping means or other workpiece surfaces. Unlike 2D contours, which consist of lines, circles, etc., "Contour milling" is performed based on vertical surfaces. vectorcam calculates CNC paths including tool radius compensation as well as a tangential start-up and run-out for one or more deliveries. vectorcam allows editing both open and closed contours. The Z start height and end depth are automatically transferred from the selected areas to the dialog box. Furthermore, the user can change the given data at any time. The „Silhouette“ results from the 3D model location in space respectively the alignment of the local axes of coordinates. The milling path moves into direction of the Z-axis along the outer model edge. With the module "Thread milling", the user mills any internal and external threads. vectorcam automatically generates the optimum toolpath based on the tool used. The number of active tool cutting edges determines the number of deliveries during thread milling. Three-dimensional helical start-ups and run-outs guarantee a clean and scratch-free surface of the thread. The helical groove milling produces a tridimensional spiral machining. It can be used for roughing and finishing. The bore diameter and the depth will be identified automatically. The output into the CNC program can be occurred with or without radius compensation. With the NC feature pocket milling, pockets can be roughed and / or finished. vectorcam recognizes open sides of a pocket and, depending on the selected tools, moves beyond the edge of the workpiece. It is not necessary to define extra geometrical aids or borders. pockets with open sides, steps etc. Undercuts or areas in which aren't accessible for the tool, are automatically taken into account. Permanent collision monitoring prevents any contact with possible model-dependent collisions or, for example, with clamping devices. The feature "Slot milling" is a special machining strategy. It is possible to process straight or curved slots. After calling the function, vectorcam displays the width and depth of the slot. The milling paths start dipping within the center of the slot. Immersion depth and angle are determined by the user. Finally, an intelligent tool preselection only proposes tools with which the production of this processing of the slot works. This machining strategy is possible both with and without cutter radius correction. In order to determine the corresponding tolerance, a fitting table is available. The user decides whether the workpiece should be roughed and finshed in one operation or whether the operations should be separated. In order to avoid unnecessary start-up and end movements, there is a choice between the Z-helical and the classic delivery. This function calculates CNC paths for chamfering. The chamfer width and angle are displayed in the dialog box after calling the command. An intelligent tool preselection only proposes tools with which it is possible to produce a chamfer with the appropriate size and angle. The machining is done with radius compensation, automatic start-up and if requested with several deliveries. The function "fillet inner" allows fast and easy handling of the workpieces with a ball end mill or a torus mill. After the function has been selected, vectorcam automatically shows the radius of the fillet inner. Afterwards an intelligent tool preselection recommends only tools that would work with this process exclusively. For a ball or torus cutter with a smaller radius than the groove to be produced , the offset of the tool is calculated by specifying the roughness depth. With this NC feature, fillet outer can be milled with a quarter-circle cutter as well as with a ball or torus cutter. The radius of the fillet outer is automatically displayed by the software and the intelligent tool preselection then proposes only tools with which the machining of the blank works on the desired parameters. For certain types of milling cutters, such as a ball or torus milling cutter, the offset of the tool is calculated by specifying the roughness depth.